Video Camera Inspections Are A Fast And Efficient Way To Diagnose Plumbing Problems. Ratech’s Elite DVD-R feature a state of the art DVD burner and a high resolution 15″ LCD monitor. With this system, the operator records the video of the inspection directly onto a DVD-R disc in real-time. The 15″ LCD monitor offers a large, crisp, and clear picture of the pipeline. The control unit can be neatly condensed into an easy to carry rugged case. 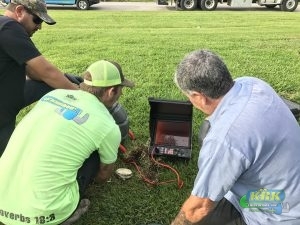 Call KRK Enterprises, Inc. in Fort Pierce and Port St. Lucie, Fl for the most reliable video camera inspections in the state! Our licensed technicians are trained in the most reliable and advanced equipment we use. Using this model of video inspection system means having the best quality images during the inspection for the fastest and most accurate analyses of your possible blocks, clogs, etc. The advantage of using camera inspections before beginning a project means eliminating the chance of an expensive or hazardous surprise later. It is also an accurate time-saver and cuts down on performing unnecessary services so that our customers may save money from the very beginning. Your time matters as much to our team of professional technicians as our does. Using a video camera inspection to locate any issue from the very first goes a long way in making a cleaning project easier on both your wallet and our experienced servicemen. Quickly steers you to the right pipe, cable, or in-line transmitter reducing difficult locates and costly mistakes. Provides more feedback with an easy to read display and multiple audio signals. Leads you directly to the location of the underground line, regardless of how the unit is held. Built with high-quality electronics and rugged, durable construction for long-lasting performance. The NaviTrack guides you quickly and easily to the transmitter. There are no nulls or false peaks to contend with. There is only one signal that needs to be maximized. How the locator is held does not affect the signal strength. The signal will get stronger as you move towards the transmitter.